Foto Friday CXVII – ..:: NJ Brideau ::.. I bet you get cold just looking at this one. For the first time this winter, the temperature has stayed below freezing here in Oxford for more than a day. I dragged myself out of my warm bed in hopes of some snow on the ground, but only found frost. Even though it was cold, I still managed to take pictures for about 35 minutes. 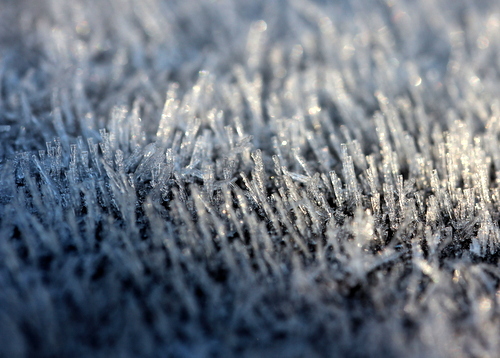 It turns out that frost/snow is very difficult to photograph because is really reflects light, and I had trouble capturing the shots I envisioned with my macro lens. Maybe that just means I’m out of practice with my camera. 1/160s f/5.6 60mm ISO 100. Cropped. Au revoir until next week.